The ICC Cricket World Cup 2015 is just around the corner, and thousands, well millions, are gearing up to celebrate the world's biggest cricket tournament. While many lucky ones will be witnessing the tournament from the stadium, others will be glued to their television. But, you can also catch all the WC action on the go through a number of mobile applications. 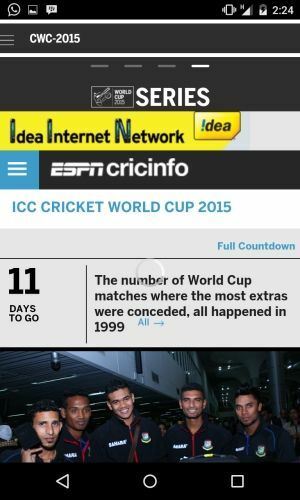 While ICC has just launched its dedicated World Cup 2015 application, ESPNCricinfo, the popular website for the game cricket, has also rolled out an updated mobile application with a new user interface, new features including some from the desktop version, and a few World Cup 2015-centric features. 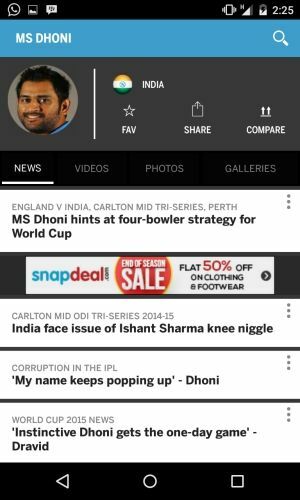 The latest version of the mobile application is crucial for Cricinfo as it aims to cash in on growing popularity of mobile platform and videos (a key feature in the application) in India. Cricinfo says the content (including videos) on the app has been well optimised for the Indian telecom networks, which are relatively slow, and for the low-end phones, which are in majority in India. 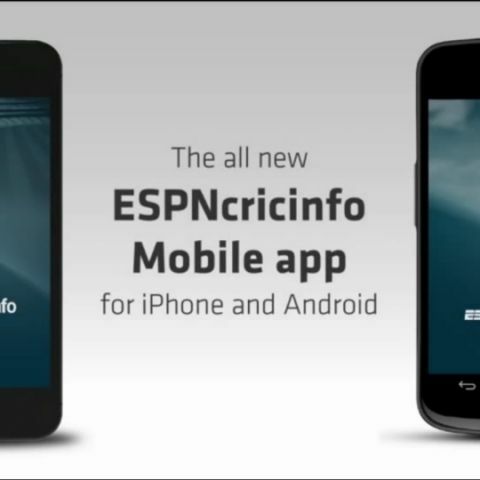 The ESPNcricinfo Cricket App version 4.0 is available for both Android and iOS platforms. The app is requires iOS 7.0 or later, is compatible with iPhone, iPad, and iPod touch. This app is also optimised for iPhone 5, iPhone 6, and iPhone 6 Plus. For Andorid users, it requires Android 4.0 and up. 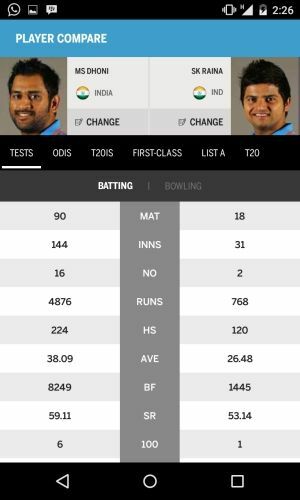 Download ESPNcricinfo Cricket App for iOS here, and Android here. On launching, you are taken to the revamped home page of the application. The blue-themed interface has four sections on the top – scores, news, videos, features and blogs. On the masthead, the app has a search button. Tapping on button on the top left, you get more categories including cricket on Twitter, series, countries, records, ranking, points table, most wanted etc. 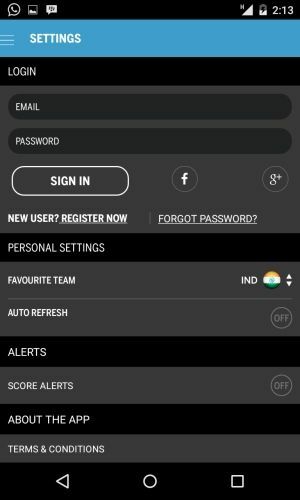 The left hand panel also features a settings button, where you can log in, set favourite team, and customise auto refresh, score alerts and other features. 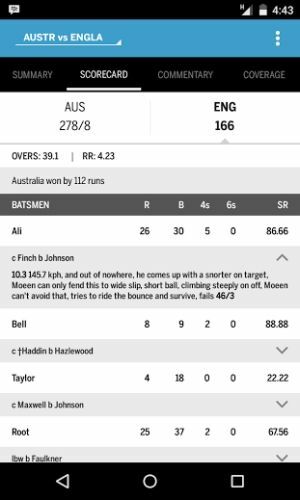 The ESPNcricinfo Cricket App version 4.0 is completely redesigned with what appears to be special focus on an easy to use user interface. 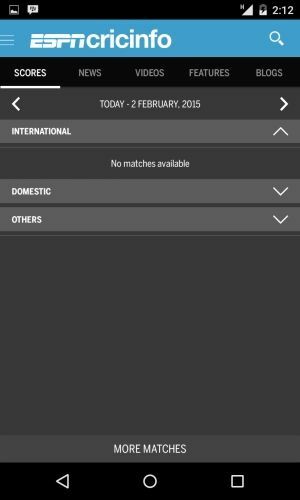 The application retains the old features such as setting favourite teams, news, fixtures and videos. However, there are a number of new features that you should look forward to. 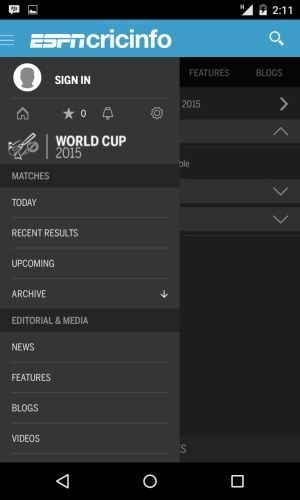 One of the first important features of the new application is the dedicated World Cup section. The section currently shows a CountDown along with an interesting trivia about the tournament. Swiping right, you are taken to sections travel – which obviously promotes the tourism in Down Under, Timelime and World Cup 2015 coverage. You need to scroll down to load more content. There's also a 'Most Wanted' section to view the most popular players. The app also provides you a consistent menu button, allowing you to navigate from one section to another without needing to the go to the home page all the time. The live commentary section has been updated to show you a summary on the top. The scorecard also features commentary where you can see how a wicket was taken. This reduces the effort of going to the commentary section and finding the wicket information. Archives is a new addition in the ESPNcricinfo Cricket App. This section, earlier only available on the desktop version, allows users to access scores and other content from matches across years. Another interesting feature you should check out is the players comparison. You can select a player and his teammate to see the number of games they've played, runs scores, batting and bowling averages. The database is quite comprehensive as it includes Tests, ODIs and even First Class matches. 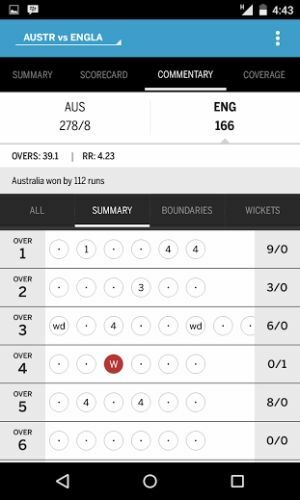 Cricinfo has added an idle mode feature that displays the live score (auto refreshes) on the home screen on your phone. The data is displayed in black and white mode, which consumes lesser power, and also keeps you updated without you need to open the app or get notifications all the time to track the score. The ESPNcricinfo Cricket App is very comprehensive and covers most of the sections available on its desktop version. Key features such as optimised videos and customisation options that reduce load on your mobile data make it worth downloading.